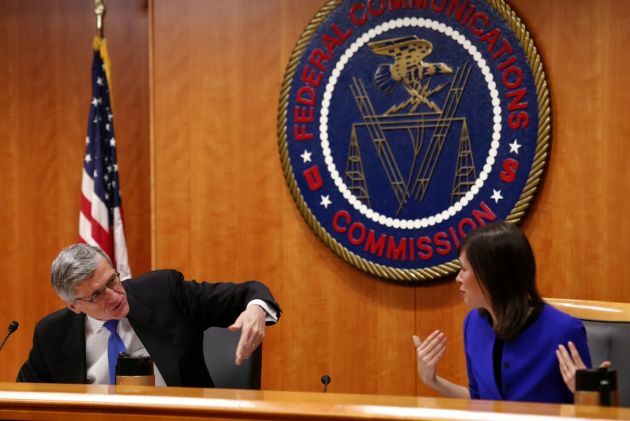 (Photo: REUTERS / Yuri Gripas)U.S. Federal Communications Commission (FCC) Chairman Tom Wheeler (L) and commissioner Jessica Rosenworcel talk at the FCC Net Neutrality hearing in Washington February 26, 2015. The FCC is expected Thursday to approve Chairman Tom Wheeler's proposed "net neutrality" rules, regulating broadband providers more heavily than in the past and restricting their power to control download speeds on the web. GENEVA - The U.N. Special Rapporteur on freedom of opinion and expression, David Kaye, has welcomed the United States Federal Communications Commission's decision to establish new regulations to protect net neutrality in the country. The FCC's rules will support a free and open Internet and ensure continued access to any lawful content individuals choose, without restriction or interference from Internet service providers. "This is a real victory for freedom of expression and access to information in the United States," Kaye said. The United States follows a small number of States, such as Brazil, Chile and the Netherlands, that have adopted net neutrality rules. "I hope the new rules may serve as a model for other governments seeking to protect or expand an open and secure Internet," said Kaye. "It is especially important that the new rules prevent ISPs from discriminating against some types of content in favor of others, either by slowing down delivery speeds or by creating a fast lane to ensure quicker delivery for only some content providers that have paid extra fees," the U.N. expert stressed. The new principles classify broadband Internet as a public utility. This will allow the FCC to regulate the Internet in the same way it regulates telephone service and other utilities. This reclassification gives the FCC regulatory control over ISPs and greater authority to enforce net neutrality. "It was by no means assured that the FCC would adopt these rules after years of consideration and public comment," Kaye said, recalling the long process and critical engagement with civil society. "Moving forward, I hope that implementation of the rules will be marked by the same openness that led to the rules themselves." Where net neutrality is not applied, ISPs may, at their own initiative or through governmental pressure, discriminate against particular content. This is done by slowing down or blocking access to certain websites while increasing the speeds by which users can access the websites of 'approved' content providers. In order to prevent governmental or third-party interference with Internet expression under the guise of prioritizing content, the Special Rapporteur urged States to revisit their own Internet policies. He also said they should consider taking action to ensure the equal treatment of content, content providers, and users within their own borders.